It was fun to make this luscious marshmallow, I like the flavor of the honey and consistency of it. Easy enough and amazingly delicious recipe. I bet it makes great S’mores brownies and topping for cupcakes! Or you can enjoy a nice warm cup of hot cocoa with a big huge marshmallow on top. Grease an 8×8 (or larger) pan and line with parchment paper in both directions. Sprinkle with a layer of almond flour mix or other coating of choice. Pour 1/2 cup of the water into your mixer bowl and sprinkle the gelatin on top. Let stand until the gelatin softens, about 10 minutes. Meanwhile, in a saucepan over medium-high heat, bring the remaining 1/2 cup water, honey and the salt to a boil and cook until a candy thermometer registers 240°F, 8 to 10 minutes. Remove from the heat. 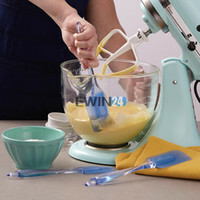 In the bowl of an electric mixer fitted with the whisk attachment, on low/medium speed, pour the honey mixture in a slow steady stream down the side of the bowl, combining it with the softened gelatin. Note: Pouring “slow” here is very important, otherwise the honey syrup will be too hot when it hits the gelatin causing the marshmallow mixture to break later when you try to spread it. Also, be sure that the syrup and the gelatin are well combined before moving to the next step. Turn the mixer to high and continue beating until it becomes thick like marshmallow creme, stiff peaks form about 10 minutes. Add the vanilla a few minutes before it’s done mixing giving it enough time to mix in completely. Turn off the mixer and transfer the marshmallow creme to the prepared pan. Smooth the top and add more almond flour mix coating. Leave it for at least 4-5 hours. Chocolate Covered Strawberries – Happy Valentine’s Day to Everyone! Finally, I have found a corn syrup free marshmallow recipe! Thanks for sharing it with us. Your blog is really beautiful with all those yummy photos. My son keeps asking me to get marshmallows and I can't bear the thought of putting all those chemicals in his body! Thank you for a recipe that sounds (almost ) too good to be true! I'll be making these for sure! GB, I know, I did not believe myself-)) It is very good and don't have any bad stuff. One marshmallow it's like eating a half of teaspoon of honey, you can do any harm with that-)) Thank you for visiting! Those look amazing and oh so very delicious! Love the honey flavor which I never had before in marshmallows. Beautiful job!!!! I have a terribly weak spot for that particular shade of blue. You match the marshmallows with the bowl and now I want both of them! Sounds like a very healthy marshmallows!